Just when you think there’s nothin’ new under the cycle travellin’ sun – a new idea squirts some grease on your gears. 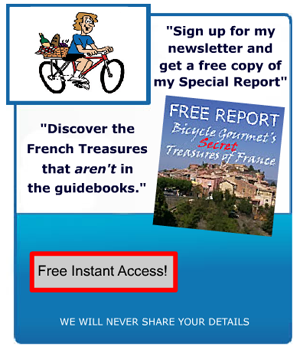 Like – Why not make French Cycle travel a lifestyle? Not just a vacation option? Ok – not a new idea for me, bien sur, but then, I’m an exception. Not the rule. And so are Darren Alff, Alastair Humphreys, Tom Kevill-Davies and Kate Harris. Four dyed in the lycra, obsessive, passionate, take no prisoners cycle nomad/explorer/adventurers. 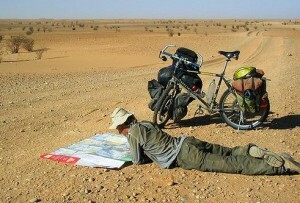 Each keeping the wolf away from their panniers with websites/blog/books relating to their cycling adventures. Great for them, yeah? So – how does this affect you? Welllll ……..now these “Fantastic Four” have morphed into cycle lifestyle evangelists. Encouraging “young people”(hopefully, “young at heart” too? )to follow in their pedal steps. Their “Mission Control” is the Bicycle Travel Network. I managed to catch up with Tom Kevill-Davies, the “Hungry Cyclist” between mouthfuls recently. BG – How did you get inspired to create it? 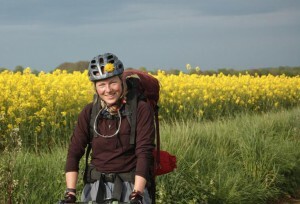 TOM – The cycle touring community is a small one and all four of us had been in contact with each other for some time. Through conversations it became clear that individually we were helping encourage people to look at bicycle travel as happy and healthy alternative but it was also clear that working as a four we had much more influence. So after a few emails crossed the globe we decided to pool our resources and try and make a collective difference. The result was The Bicycle Travel Network. BG – Why the word “network” in the title? TOM – A good question – countless emails went around the four of us while we looked for a name and in the end network seemed to work best. As well as providing funds and aid to first time bicycle travelers one of our main aims was to create a network of new generation bicycle travelers who are out there doing what they love and sharing what they learn from their experiences in an online environment. BG – What were some of the challenges you faced putting it together? TOM – Coming up with a name? no that was pretty simple in the end… – I think the biggest hurdle was trying to pin down the four founders at any one time to make decisions- hard to do when each one us spends the majority of our time out on the road looking for adventure. 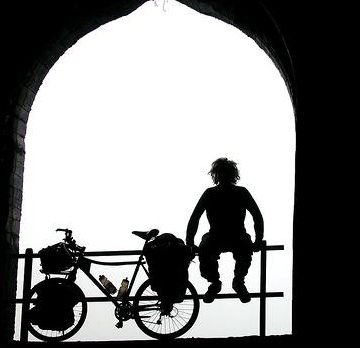 But once we were all talking it became very clear that we all wanted was to combine our collective knowledge and experiences with other prospective bicycle travelers – from then on the whole project took on its own momentum and it was downhill from there – so to speak. BG – What expertise/inspiration etc. does each individual member of your team contribute? 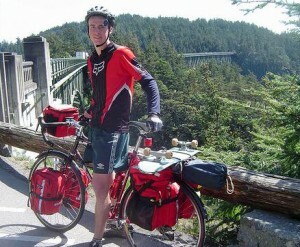 TOM –The world of bicycle travel is a small one and we had all been in contact for some time. Knowing about each other and our different offerings it became clear that each of us was making good head way in the same field and yet each with a very different approach. Darren was forging ahead providing first class technical information for cycle tourists through Bicycle Touring Pro, Al is leading his field in motivational advice and expedition planning, Tom has been showcasing the more enjoyable and cultural sides of bicycle travel while Kate is out there as a ground breaking female adventurer. With these four areas of expertise covered it was a case of ‘One for all and all for one! BG – Why the focus on “young people?” i.e. – why not all people on the same wavelength? TOM – This was a tough decision. We were keen not to discriminate through age but with all of as having made talks at schools and youth clubs to promote travel by bicycle we were aware that the younger generation were the ones that needed the most help. Like so many things in life if you can get the little push and encouragement you need when you are young the rest is history. And so by helping budding young bicycle travelers we hope to be aiding bicycle travelers of all generations in the future. TOM – Its early days for the project but we hope our main revenue streams for donations to come through the following sources. 1. Income from cost per click advertising on a website dedicated to a niche market. 2. Equipment donations from equipment companies in return for advertorial, field testing, and banner space on the website. 3. 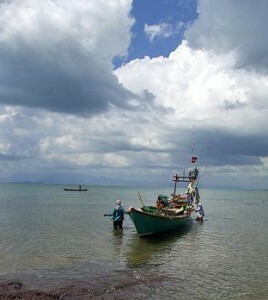 Donations of old equipment and private donations from generous folk who want to help change a young traveler’s life. BG – What’s your goal? 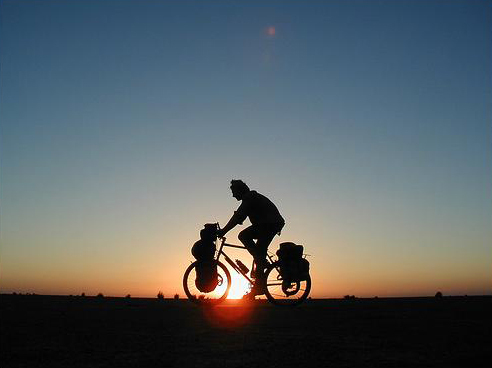 TOM – To make travel by bicycle the first choice for anyone looking to have an adventure or see the world. BG – How can people help? TOM – Spread the word – pop a link on your blog or web page and tell your friends! If you’re a company looking for a targeted marketing opportunity for your products get in touch! And if you have a few quid you can spare, make a donation today! THROW ME A BONE HERE PEOPLE! great idea.thanks for giving us the lowdown. Interesting lifestyle option – especially if your money comes from the internet. my heart digs it, but i wonder how my legs would take it! – still, hard to say “no way” completely, if you know what i mean? Having done several long cycle trips, your article may have pushed us over the edge! thanks for letting us know about this. This is the type of program that governments should be sponsoring. Giving young people motivation and valuable life experience. this is too funny! i want to make this with my bicycle and i thank you for telling us. very enjoyable post. and a great idea. for all peoploe.not just the young. Cutting edge article – with a nod to the “internet revolution.” Without which this lifestyle option would not be available for most.